This web site is for anyone with an interest in the Bible and the "Historic Peace Churches" (Brethren, Mennonites, Quakers). Help bridge the gap between academic/scholarly readers of the Bible and non-academics, and between "believers" and those who feel no religious affinity for the biblical text. Help people who want to learn the languages in which the earliest manuscripts of the Bible are written: Hebrew, Aramaic, and Greek. I'm particularly interested in those who are studying these languages outside a formal classroom setting for whatever reason. Help Brethren, Mennonites, Quakers (and anyone who feels an affinity for any of these groups) to engage Scripture more deeply. Offer ideas for working with Scripture ecumenically and in interfaith settings. Give me some practice learning HTML and web page design. Please let me know what you think about how I'm doing with any of this. I'm especially interested in communicating and synergizing with folks who share any of these goals and interests. Thanks! Grace and peace of the Lord to you! This web page was last updated on September 6, 2014. I haven't checked all the links yet, but I'm working on it. Sorry for the year or two of neglect - I've been ill.
Lots of other Christian groups have Peace Testimonies as well. But how about: Every Church a Peace Church? Papers from "Theology and Culture: Peacemaking in a Globalized World," a consultation of "historic peace church" theologians held in Switzerland June 2001 as a response to the World Council of Churches' "Decade to Overcome Violence." The Bienenberg Declaration lays out some Christian principles behind the idea of a "Peace Church." Elizabethtown College has put their Peace Pamphlet Collection online; many are representative of the biblical bases for Historic Peace Church understandings of peace. Check out the July/August 2009 Issue of Quaker Life magazine, whose theme is "Friends and the Bible." Several excellent articles are linked from the web page, including Doug Shoemaker's "Friends and the Bible" and Michael Birkel's "Early Friends and Scripture: The Language of Spiritual Intimacy." Comprehensive site, including online study Bible, Hebrew and Greek interlinear Bible, concordances, commentaries, devotional materials, dictionaries, and many other helps. Includes special fonts you can download and view the actual Greek and Hebrew characters, for example in the Theological Dictionary and Lexicon sections. Lots of Bible versions in lots of different languages; you can look up passages by chapter and verse or search for particular words or phrases. Translations, commentaries, devotionals, dictionaries. Easy to use, but doesn't include NRSV, NIV, or recent reference works. Intended to be a comprehensive list of the terms one comes across when moving from devotional Bible study to academic, scholarly Biblical Studies. Some of the words are peculiar to the various disciplines of "The Guild," others are more general terms that non-academic readers like myself sometimes experience as stumbling blocks. A work in progress, like the rest of this web site. Brief biographical information on some important present and past biblical scholars. Resources for learning biblical Hebrew, Aramaic, and Greek. Annotated bibliography with links organized by discipline and biblical subject. "This survey covers a small part of the huge body of New Testament studies --- how the Church selected certain writings as authoritative and separated them from a larger body of early Christian literature. In view of the central importance that the New Testament has within Christianity, it is amazing that there is an absence of detailed accounts of such a significant process. My goal is to collect and organize the information that is available, and make it easily accessible in the form of hypertext.... I especially hope this site will be useful to persons who cherish the New Testament, but are unfamiliar with the history of its development...."
Some of my favorite and most-used reference books. Annotated list with links to reviews and author information. EMail list. "The purpose of this list is to allow the interested person to post questions regarding the whole gamut of Biblical Studies. Archaeology, linguistics, exegesis, history, textual issues, all are legitimate areas of inquiry for this list. Academic or simple questions are allowed. All are welcome to participate; Veteran scholar or interested layperson; cleric or lay; Protestant, Catholic, or Jew." "Founded in 1880 to advance the public understanding of the Bible and biblical scholarship." The major North American professional organization of biblical scholars. I'm a member (you don't need a PhD or a full-time academic appointment to join!) and have attended the annual meetings the last several years. SBL meets each November in cities around North America. "Friendly Bible Study" by Joanne and Larry Spears is online. Check it out! "The Renovare movement fosters spiritual development as the heart of social justice." From Sojourners Magazine. I recommend the "Renovare" spiritual formation process very highly. It's easy to start your own group, and amazingly rewarding. "Studying the Bible Together: A Resource Packet for Ecumenical Bible Study"
Scroll down the list to get to this downloadable pamphlet prepared by Eden Grace, a member of New England Yearly Meeting (Society of Friends/Quakers) who is very active in the ecumenical movement. Gives practical advice on starting and nurturing Bible study groups across faith traditions. "Using the Internet in Ministry"
Autobiographical article by Bill Samuel, a Quaker who has done much to facilitate online ministry among Friends. Article in QUEST (Quaker Ecumenical Seminars in Theology) Issue 4 by Ron Mock of George Fox University in Newberg, Oregon. Two parts: "What can the Bible teach us?" and "about peace," plus a response by QUEST editor Chuck Fager. PEACE CHURCH SEMINARIES IN THE MIDWEST U.S.
Bethany Theological Seminary Located in Richmond, Indiana. Church of the Brethren. Earlham School of Religion Located in Richmond, Indiana. Religious Society of Friends (Quakers). Illness and lots of inward changes has left me trying to regroup, rethink, realign myself with whatever the Lord has in store for me, now. Kaimosi Kenya. I visited Kaimosi back in the 1990s, still think of and pray for these Friends often. A brief list of disciplines you can use to get closer to God through Scripture. A comprehensive Scripture index to early Quaker writings. A work in progress. I have long admired and used the author's work in making accessibly early Quaker uses of the Bible. Thanks so much to Esther Murer! Online as of this writing: Genesis, part of Isaiah, Matthew, Mark, Luke, John, Romans, 1 Corinthians, Hebrews, James, 1 & 2 Peter, 1, 2 & 3 John, Jude, and Revelation. "Racing Across the Lines: Changing Race Relations Through Friendship"
By Licia Kuenning. Why and how to read early Quaker writings. Method for Quaker Bible study groups; by Joanne and Larry Spears. Online courses in Bible, biblical languages, theology, church history. Courses are free to audit, or if you want interaction with the instructor and/or continuing education credit it costs $50/course. Heavy emphasis on biblical languages, which is unusual in online Bible courses. A wonderful example of the potential of the internet for sharing resources widely and low cost. "What Makes a Successful Online Student?" Geared toward folks taking college-level courses online, but the principles apply more broadly. "Paul and Fox on the Road to Damascus: Sent to Turn People to the Light"
Paul being the author of New Testament books like Romans, Galatians, and Thessalonians as well as a main character in the book of Acts. 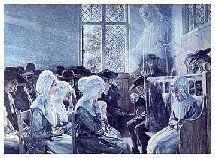 Fox being George Fox, the person usually credited as being the founder of the Society of Friends (Quakers). Paul's "Damascus Road Experience," described in Acts 9, 22, and 26, is often taken as prototypical of a certain kind of conversion experience. I look at another aspect of it, his sense of mission around going forth to proclaim the gospel and "turn people from darkness to light, and from the power of Satan to God (Acts 26:18). This is a slightly modified version of the introductory chapter of my MA thesis (Earlham School of Religion, 1999). I hope to post more later. "How the Internet is Transforming Scholarly Research and Publication" by Earlham College Philosophy professor Peter Suber. I'm in the early stages of actually using the free online New English Translation; so far I like it very much. But what's REALLY great is the philosophy behind it -- check out the Preface. Concept and prototype of one man's dream of a hypertext Bible commentary. Wow! Links to resources concerning the academic discipline of Christian Theology. I hope to update it "'fore too long"! A sermon by C. H. Spurgeon. "As for you, my brothers and sisters, who have not to preach, the best food for you is the Word of God itself. Sermons and books are well enough, but streams that run for a long distance above ground gradually gather for themselves somewhat of the soil through which they flow, and they lose the cool freshness with which they started from the spring head. Truth is sweetest where it breaks from the smitten Rock, for at its first gush it has lost none of its heavenliness and vitality. It is always best to drink at the well and not from the tank. You shall find that reading the Word of God for yourselves, reading it rather than notes upon it, is the surest way of growing m grace. Drink of the unadulterated milk of the Word of God, and not of the skim milk, or the milk and water of man's word." EMail me at: susan@read-the-bible.org. For more about some of my interests, my "About Susan Jeffers" page, and my page at jeffers.bethanyseminary.edu. The following webring contains a variety of sites with widely varying views on what it means to be a Quaker. If you find a site that appeals to you, or one that offends, keep going -- you're sure to find the opposite as well!